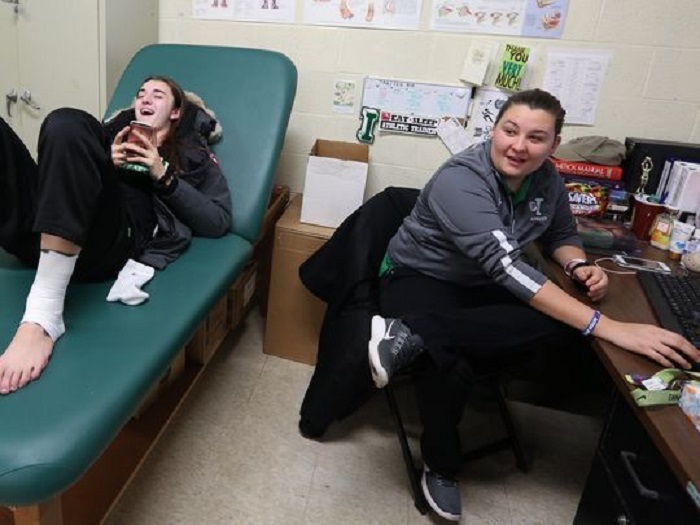 IRVINGTON - Hana Gross does not work at Pelham Memorial High School, but her shift on Dec. 27 ended up being one that would change her life – and that of a local basketball player – forever. Gross was part of a team of individuals that resuscitated Blind Brook boys basketball player Jordan Schoen after he collapsed in the middle of a game at Pelham Memorial High School and went into sudden cardiac arrest. Schoen flatlined for about a minute while Gross – along with Pelham detective John Hynes, Pelham police officer Michael Sheehy, and a Blind Brook parent who is a doctor but did not wish to be identified – worked on him. Schoen was rushed to New Rochelle Hospital Emergency Department, where he was stabilized, and later transferred to the Children’s Hospital at Montefiore in the Bronx. The Pelham Police Department’s work in blocking traffic allowed Schoen to reach the hospital in just seven minutes. Dr. Robert Pass, the Associate Chief of Pediatric Cardiology at Montefiore Medical Center, performed a two-and-a-half-hour procedure on Schoen that involved putting a defibrillator and pacemaker in his heart. Pass said the result would have been catastrophic had Schoen not promptly received the proper medical treatment. “It is the only reason that he is alive,” Pass said. Gross works for Symmetry Physical Therapy in Pelham, but is contracted to Irvington High School, where she is the head athletic trainer. Ruth Gillespie, who also works for Symmetry and is the head athletic trainer at Pelham, asked Gross to cover for her while she was out of town. With approximately one minute left in the first quarter, Schoen fell backwards onto the floor. Gross initially suspected that Schoen fainted from not eating breakfast before the noon tipoff. Schoen quickly began seizing, and when his father Steve informed Gross that his son had no history of seizures, treatment for sudden cardiac arrest began immediately. The doctor in attendance did chest compressions while the police officers hooked up the automated external defibrillator. Gross tended to Schoen’s airway, which proved to be a prominent factor in his survival. Alice and Jessica Schoen, Jordan’s mother and sister, have taken CPR classes since the incident. Steve and Alice Schoen are now on a mission to highlight the importance of knowing how to conduct CPR and of having defibrillators accessible to the public. Gross said she did not do anything out of the ordinary. “When it comes down to it, you’re just doing your job,” she said. The reality of saving a life also hasn’t hit her, she said, even though a certificate acknowledging her heroic efforts hangs on the wall next to her desk at Irvington High School. “I don’t even know if I could pick him out of a lineup,” she added. Gross said the Dec. 27 incident, while horrifying, shows what athletic trainers may sometimes – but hopefully never – have to face on the job. Byrnes, the Yorktown athletic trainer, was a little more blunt with his feelings on the value of certified athletic trainers in schools.